The first of the Cosmic Odyssey sourcebooks for Starfinder clocks in at 52 pages, 1 page front cover, 1 page editorial, 1 page ToC, 1 page advertisement, 1 page SRD, 1 page blank, 1 page back cover, leaving us with 46 pages of content, so let’s take a look! All right, we begin with a brief contextualization of the Jolly Rogers and the historical pirates and goes on to extrapolate some components that may differ in space – from tight-knit ports to specific practices – walking the plank would be rather lethal in space, with the airlock being the analogue. This, obviously, generates some deviations in the style that is ascribed to space pirates from the clichés we tend to associate with our terrestrial ones; it is important to remain cognizant of this fact, for it represents a thread that is woven throughout the book. This grounding in historical facts is something I personally enjoy very much – while I don’t expect it for space opera gameplay à la Starfinder, it is nice to see some foundation here. In an example, we actually get a reproduction of Captain Bartholomew Roberts (aka Black Bart)! We have two different themes included here; the Brute nets +1 Str; the theme knowledge allows for the reduction of Medicine DCs to treat deadly wounds as well as for first aid. This also nets Intimidate as a class skill, or +1 to the skill if you already have it as a class skill. 6th level unlocks halved penalty for non-proficient weaponry (-2 instead of -4); 12th level provides hardhead, which is a bit weird: If you’re “reduced to 0, and make you unconscious”, you get a Fort save with the DC equal to damage taken. On a success, you remain conscious, with 1 HP remaining; this applies even if you have no Resolve Points left or don’t want to use them. On a nitpicky level, there’s a “HP” missing after the 0; on a rules-level, this is a bit weird, considering that staying in the fight via Resolve requires stabilizing. Also, how does this interact with nonlethal damage? Technically, that is not “0” per se. This ability would probably have been more elegant, if it modified the Resolve uses instead. As provided, it is rather rough around the edges. Anyways, 18th level lets you regain, up to twice per day, 1 point of Resolve for defeating an enemy whose CR is no more than 2 below your level. Not a huge fan here, considering the metagamey aspect of CR. On a rules-aesthetic level, personally, I’d have used SFRPG’s reaction-system here instead of free access. The theme is not broken, but also feels a bit raw. The second theme here would be the rogue, who gets + 1 Cha and reduces the Diplomacy check to improve attitudes. Class skill-wise, it nets Athletics, with the usual +1 if you have it caveat. The 6th level ability nets you a +1 luck bonus to all untrained skill checks. 12th level can be a double-edged sword – Culture DC 10 to know your name, 20 to recognize you from appearance alone; on the plus-side, this also means that you have fans of sorts, which makes it easier to find helpful and friendly characters to aid you in your exploits. The 18th level ability is pretty much the same as for the brute, but you may also regain Resolve when achieving hard skill checks (20 + ½ character level). The hard cap prevents abuse, but yeah…would have preferred a wholly different ability there. We get 3 new archetypes next: The boarder gains his alternate features at 2nd, 4th and 6th level, making it in that regard structurally analogue to the Starfinder Forerunner from the core book. The first ability nets you a +1 insight bonus to EAC and KAC when within 10 ft. of terrain that could grant you cover. 4th level nets a +2 insight bonus to weapon damage with blast weapons, but only versus targets within 10 ft. of you. This bonus increases by +1 for every 4 character levels attained. Furthermore, when aiming to not damage hulls, you can treat the hardness of the objects in your blast as +20 higher; basically, you won’t inadvertently destroy hulls. The final ability lets you always act in surprise rounds, on your initiative. If you “gain surprise” then you get +2 to atk and damage rolls. Okay…so does that mean that you only get this is all foes are surprised? Or do you get it against foes that are surprised, even if not all foes are? The interaction with the surprise mechanics are a bit rough here. Gunners also gain alternate class features at 2nd, 4th and 6th level…or is that 2nd, 6th and 9th? The archetype contradicts itself there. The first attack with a ranged weapon in any combat (urgh, per combat ability…how have I not missed you) gains a +4 “equipment bonus” to atk and damage. Guess what bonus type does not exist in SFRPG? Bingo. By spending 1 Resolve Point, you can extend this bonus to subsequent rounds. And this makes it weird. So, a brief lull in combat nets you a free round of the bonus when hostilities resume. 6th level nets chain shot: When hitting a creature, it gains a save versus 10 +1/2 your level (class or character? I assume class here, analogue to the general definition) + your key ability modifier; on a failure, their speed is reduced to 0 for the round. Vessels must succeed Piloting checks instead to prevent their speed being reduced to 0; the pdf mentions that, at the GM’s discretion, these may continue moving, but sans directional control. I appreciate this caveat, but I would have loved to see that codified in precise rules instead. 9th level nets grapeshot; i.e. you can use non-blast weapons as blast weapons, but halve their range. Cop-out: Does not specify the interactions with ammunition, which e.g. Starfinder’s Fussilade does; it also can presents some RAW really wonky examples. RAW, this can be used with e.g. tactical crossbows or sniper weapons. The third archetype would be the senior officer, who gains commanding presence, usable as a standard action 1 + ½ character level times per day, granting all allies within 30 feet +1 (untyped, should probably be morale, analogue to the archetype’s other abilities?) to Will-saves for the next round, which increases by +1 for every 6 levels beyond 6th. 9th level provides a similar boost for attacks versus a target in line of sight; slightly odd here: The ability is phrased in a way that makes it not 100% clear whether you have to attack the target as well (or need to have attacked it), though I assume that this is not the case. If you spend 1 Resolve point, you increase the bonus granted by +1, a further +1 every 5 levels after 9th. The wording here should probably use “increase” instead of “a further”, since morale bonuses usually don’t stack. While the functionality is there, the verbiage is a bit rough. In a weird decision, this has no daily cap. The 12th level ability lets you use a standard action to increase the speed of allies – it does not specify a range, how many allies can be affected, or a daily cap. Nasty typo: “By spending 1 Resolve Point they gain this speed increase for a number of levels equal to 1 + your key ability modifier.” Emphasis mine. Now, if that isn’t the best Resolve point ever spent! Kidding aside, this is problematic. Next up, we get 6 new drone chassis types for the mechanic: Assassination, demolition, hacker, maintenance, infiltration and sentry drones are provided. As a whole, this section is solid, though I am pretty sure that the demolition drone has a glitch – I can’t deduce where the uncommonly high ACs come from (14 in both, Dex 10, mods don’t account for it); on the plus-side: Rules for laying mines! We also get a new mystic connection, the destroyer, which should fit, theme-wise, the demands of players looking for one that feels less…wholesome. They can channel scaling “electric” damage (should be electricity) via attacks versus an opponent’s EAC, with a range of 30 ft.. 3rd level allows you to undermine the hardness of objects by touching them (with object-size as a limiter, thankfully). The connection also yields a scaling bonus for allies in telepathic bond via Resolve. This ability also has no duration; defaulting to channel skill also doesn’t help, since the bonus applies to atk and damage. 9th level yields a touch attack that deals scaling untyped damage, and heals you for as much, with excess hit points gained as temporary HP that last a full hour. Yes, it costs one Resolve to use, but would you mind lending me that kitten? I need to refresh my shield of temporary HP before entering the fray. 12th level provides a somewhat confused ability: “Whenever you or an ally linked by your telepathic bond class feature scores a critical hit against a foe, you can spend 1 Resolve Point as a reaction to confuse that enemy. The foe must succeed at a Fortitude save or become exhausted for 1 round.“ Sooo…which is it? Confusion? Exhaustion? The ability also refers to the “sow doubt” ability in the following text. Guess what the connection doesn’t have? Bingo. 12th level nets tremor-based blindsense – which should be blindsense (vibration) in SFRPG’s formatting, not blindsense (tremors). The 18th level ability lets you call forth a tremors and a volcanic eruption via 1 Resolve. Here, it should be noted that the ability gets full action right – the pdf has several legacy “full-round action”-references. The book also contains a new 4th level technomancer spell, nightcloak, which is per se damn cool – basically invisibility for ships. Somewhat odd: Ships of a larger size (Huge +) require multiple castings of the spell…so, when do the benefits run out? How exactly does that work? Next up would be the new equipment section. Here, we get breaching charges and pistols, chemcutters, the classic cutlass (including several variants, including, but not limited to, molecular rift, buzzblade, and ripper). Two lack the damage-type shorthand in the table. Other than minor glitches, I enjoyed this section – and the same can be said for the starship equipment. Huge plus, as far as I’m concerned: Hyperspace beacons are provided with rules and beacon hijackers make all sorts of sense to me. Ship-damaging thruster boosters…nice. We also get a boarding shuttle and a Tiny gunship and there are rules for ramming other starships.Kudos! The next section is GM-facing and deals with a couple of sample organizations, each of which comes with supplemental characters. This book predates the release of Alien Archive, so NPCs are built in accordance with PC-presentation and rules. No, I’m not going to penalize the pdf for that. Additionally, we get explanations of methods as well as a couple of adventure hooks for them The Crimson Corsairs get a CR 5 character, the CR 10 leader and stats for her vessel. The Crew of the Misty Maiden is next, and finally, there would be the Swiftsure Pirate Hunters – and much like in real life, the distinction of pirate/freebooter/legal authority may be a fleeting one. The final section of the pdf presents 8-Piece Port, a pirate neutral zone composed of asteroids, held together by gigantic girders; each of the asteroids can be considered to be its own sub-settlement of sorts, featuring fluff-centric notes on NPCs of note, settlement stats as well as notes on industry and quite a few adventure hooks. We do get a nice full-color map, but no key-less player-friendly version of it. 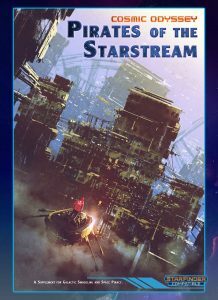 Editing and formatting of this book show that it is one of the earliest releases for Starfinder – it does sport quite a few relics and instances where the conventions have not been perfectly implemented. Layout adheres to a really nice two-column full-color standard and the pdf sports quite a few nice full-color artworks. The pdf comes fully bookmarked with nested bookmarks for your convenience. Kim Frandsen’s book on space pirates has me rather torn. On the one hand, I like the leitmotif and aesthetics of the book – the way in which historical tactics are extrapolated and brought to the space age; I like how ramming is covered and the items also are rather nice. The GM-section is interesting and I can see the 8-Pieces Port become a regular haunt for quite a few PCs. That being said, this book also suffers from being an early release in that rules-language isn’t as precise as it should be. A few glitches in the details can be excused, but the number that can be found within does drag this down a notch. Whether you’d like this pdf imho wholly depends on whether you’re a GM or a player – the player-facing options are not that great, while the GM material is more interesting. In short, the book, as a whole, is a quintessential mixed bag. Hence, my final verdict will clock in at 3 stars. You can get this sourcebook here on OBS!